In the rugged hills between Orinda and Berkeley are exposed a complex suite of lithologies spanning marine to terrestrial environments, deepwater to fluvial sediments, and a thick sequence of basalt flows. The latter were the focus of the May 21, 2005, NCGS Field Trip ably led by Dr. Stephen C. Edwards and Dr. Mel C. Erskine, Consultant and long-time NCGS officer/advisor. Mel provided technical support, but Dr. Edwards was the trip spokesman. He described geological features at each stop and provided historical insight into the interpretive evolution of the local structure and lithology based on his experiences as a U.C. Berkeley student. U.C. 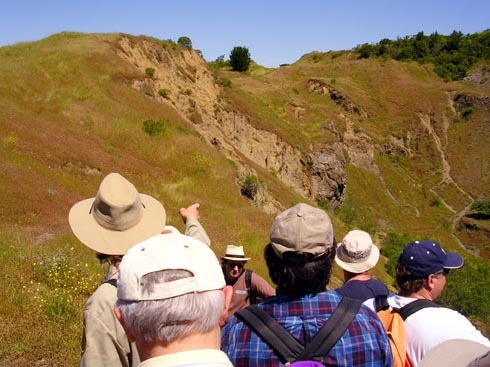 Berkeley Professor Emeritus Garniss Curtis, one of the early proponents of the potassium-argon radioactive dating technique, spent decades unraveling the geology of the East Bay Hills, and in particular, the volcanics exposed in the Sibley Regional Preserve. According to Stephen, the results of prodigious student mapping were not shared in the technical literature so that future mappers would not be able to purloin crucial information from published reports. 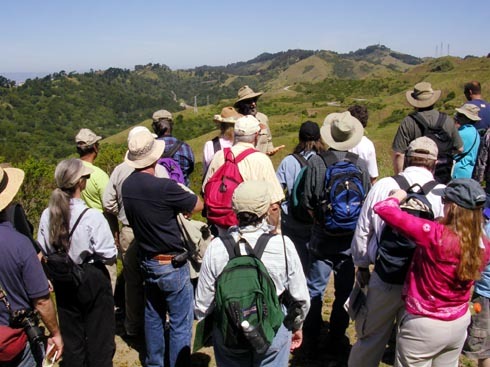 The Berkeley Hills has been of interest to local geologists, particularly the UC. Berkeley school, since the turn of the century. Andrew Lawson and his students mapped the Siesta Valley syncline just north of Highway 24, but no further south. Their interests lay with the sediments and volcanics in the hills adjacent to the university. In the 1940’s and 1950’s, Dr. Curtis began extensive mapping to the south. He interpreted Round Top, the highest peak in the Berkeley Hills, as a volcanic vent. As a young university student, Dr. Edwards was one of scores who mapped the area to fulfill their field training requirements. He continued to map and refine the local stratigraphy as a UCB graduate student, and is still doing so today. 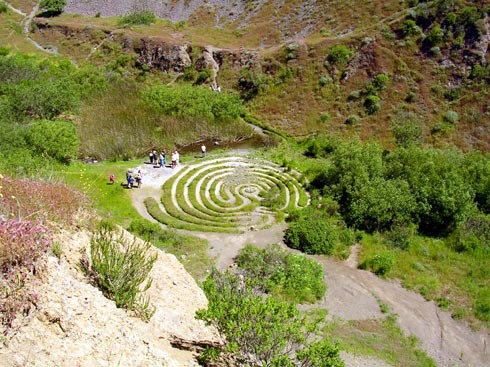 Structurally, the Sibley Regional Preserve volcanics are part of the Siesta Valley syncline, a large trough-shaped structure overturned slightly on its western limb. The basalt flows interbedded with marine to terrestrial sediments form the highest ridges. Outcrops I the Preserve showcase a variety of volcanic features, including lava flows, intrusive dikes and sills, breccias, volcaniclastic sediments, and sedimentary alteration features associated with eruptive events. The flows have been extensively dated at about 10 million years using the Ar39/Ar40 technique, considered more accurate than the potassium-argon (K-Ar) method used by Garniss Curtis and his colleagues decades ago. The argon-39/argon-40 dates form a tighter cluster than the K-Ar dates, and indicate active eruptions occurred over a few hundred thousand years. Comprising the Miocene Moraga Formation, the basalts, volcaniclastics, and volcanic sediments are thought to be part of a much larger and compositionally more diverse volcanic field that has been dismembered by right lateral strike-slip along the greater San Andreas Fault system. Garniss Curtis believes the Sibley/Berkeley volcanics to be a northward displaced piece of the Hollister Quien Sabe volcanic field located 80 miles south on the east side of the Hayward-Calaveras Fault system. The Indian Rocks rhyolite outcrops in Berkeley (Northbrae Rhyolite), the andesites and dacites of Mt. Burdell north of Novato (Marin County), and the Tolay Volcanics in subsurface Sonoma County are also considered part of the Quien Sabe Volcanics. The Sibley Volcanics consist of basalts and basaltic andesites, with a considerable range in textural characteristics and structural style. The landscape is dominated by the vent at Round Top Mountain. Quarrying and deep erosional dissection of the near-vertical dipping strata have exposed the subterranean volcanic architecture here like nowhere else in California. 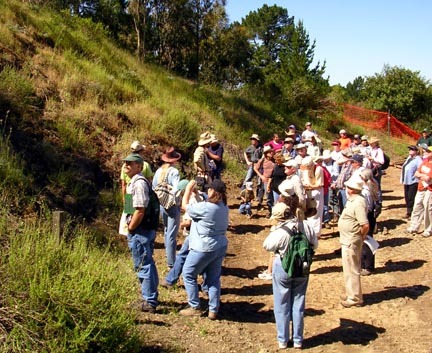 After sharing these historical and geological facts with the sizable group assembled at the Sibley Regional Preserve’s Visitors’ Center, Steve led the eager crowd south and east to a vantage point nearby. Here he pointed out distant ridges formed by dike complexes that fed the now eroded overlying volcanics. Round Top loomed to the east, dominating the skyline. 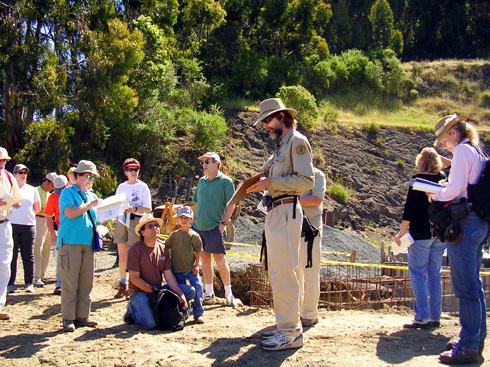 Continuing uphill, the group stopped briefly at an East Bay Municipal Utilities District construction site exposing a vent in the hillside. The cut exposed dikes of aphanitic (fine-grained) plagioclase-augite (pyroxene) basalt crosscutting breccias and tuff-breccias containing chunks of the underlying Orinda Formation. The breccias were extruded from the vent and are overlain by a thicker layer of the basalt with may represent lava pooled above the vent opening. The north side of the construction site provided a breath-taking view of the ridges and valleys of the surrounding East Bay Hills. As the trail wound around the northern flanks of Round Top, Stephen pointed out a distant break in slope representing the contact between the Moraga volcanics and the less resistant Orinda Formation. At this point, the group was standing on an ancient lava pool. A botanist by training, Stephen noted that various lithologies in the area can be identified by the vegetation they support. This is a characteristic long used by geologists when field mapping. These differences become particularly evident in the rainy season, when plant life is lusher. Native Americans used the basalt for bedrock mortars to grind acorns into flour. Although Stephen has mastered the art of arrowhead flaking, and done so with basalt from the Sibley Preserve, only sparse artifacts have been found to suggest the local Indians had shaped the volcanics into arrowheads. Trekking farther along the trail, Stephen stopped at an outcrop exposing the contact with the Orinda formation. Water seeping from the outcrop showed the excellent water retaining properties of the heavily fractured volcanics, which are superb aquifers. An abandoned Kaiser Sand and Gravel quarry on the northeast flank of Round Top exposed another vent. From this vantage point, Stephen described the brecciated vent-filling volcanic debris and slightly overturned attitude of the volcaniclastics. The vent was several hundred feet long and occupied a topographic high that was where the pit now lies. Eruption here occurred between 9.6 to 10.0 million years ago. A layer of well-bedded tuff is also revealed here, containing freshwater mollusk remains that indicate water pooled in the vent during dormant periods. Flows at this site are intensely vesicular, which suggests the lava flowed over ponded water or a water-saturated substrate. 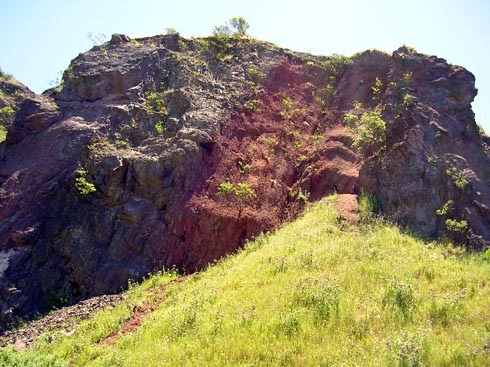 The brilliant red basal “baked zone” is observed elsewhere in the Berkeley Hills volcanics and is thought to be an oxidation feature linked to steam generation as the flow advanced across the Miocene landscape. The group crossed over the Moraga-Orinda contact as they entered an area normally closed to the public. A ravine on the trail has been interpreted as block downdropped by faulting. Garniss Curtis thinks the nearly horizontal, rotated beds in this location, which were more vertically inclined before regional folding, are evident of viscous “plowing” action by the advancing flow fronts. Stephen mentioned that Miocene camel fossils have been found at this site. A series of punctuated stops in the restricted area provided examples of tuffs, possibly water-lain, overlying basalt, a exposure of opaline amygdaloidal (almond-shaped mineralized vesicles) volcanics, an autobrecciated (fragmented during emplacement) flow, flows with basal baked zones, and an agglutinated lapilli tuff representing cinders deposited close to a vent opening. The final stop was in the northernmost end of the park overlooking Highway 24 far below. Stephen produced a poster illustrating Garniss Curtis’s Round Top Mountain block diagram. This geological map showed relationships between the Sibley volcanics and other igneous outliers in the Berkeley Hills to the north. Of particular interest was U.C. Berkeley geology professor George Brimhall’s Berkeley Hills Rhyodacite Tuff exposed a mere 4 miles to the north. Also shown were the Hayward and Wildcat Faults. Stephen discussed their probable effects on the regional structure and juxtaposed lithologies. One theory proposes that the Rhyodacite Tuff may be a dismembered part of the Sibley volcanic field transported to its present location by 4 miles of offset along the Wildcat Fault. Regardless of their interpretation, correlating the various volcanic lithologies and fault-sliver outliers in the East Bay/Berkeley Hills provide a fascinating research topic for Bay Area geologists. 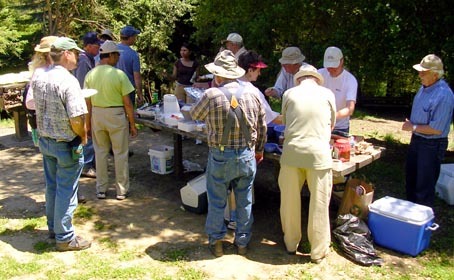 Upon concluding his presentation, Stephen and most of those in attendance reconvened at a site in Berkeley’s Tilden Park for a delicious salmon and chicken barbecue provided for the NCGS by Tridib and Mita Guha. Ron Crane deserves thanks for helping set up the picnic tables and lighting the barbecue pit. Guest Dennis Jones, and members Mark Sorenson and Dan Day manned the barbecue under Tridib’s watchful eye. John Stockwell provided some vegetarian dishes. Clean up was assisted by Chris Higgins and his wife Jane, Kathleen Burnham, and Mark and Karel Detterman. Field Trip Coordinator Tridib Guha merits recognition for scheduling the field trip, planning and executing the barbecue, and making the necessary arrangements with Tilden Park. Mel Erskine provided Stephen Edwards with technical support. 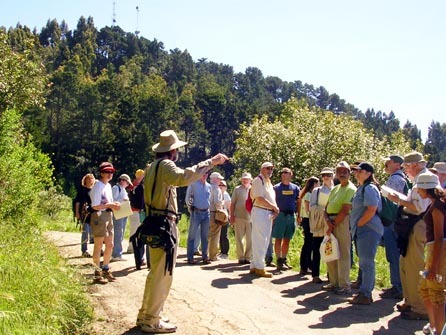 The NCGS would be remiss not to show its sincerest appreciation to Dr. Stephen Edwards, Director of the Tilden Regional Botanical Garden, for sharing his knowledge of the Sibley Volcanic Preserve with its members. Stephen gave an outstanding presentation, laced with his subtle humor, on one of the most spectacular volcanic sites in the Bay Area. It also goes without saying that Stephen has been largely responsible for chronicling the geological history of the Preserve, for providing displays to share this information with the public, and for continuing his own field research to better understand the local geology. To this we are deeply indebted to him.